Hardwood Escrima Fighting Stick | BUDK.com - Knives & Swords At The Lowest Prices! Looking for an escrima stick that will look great for your competition kata? 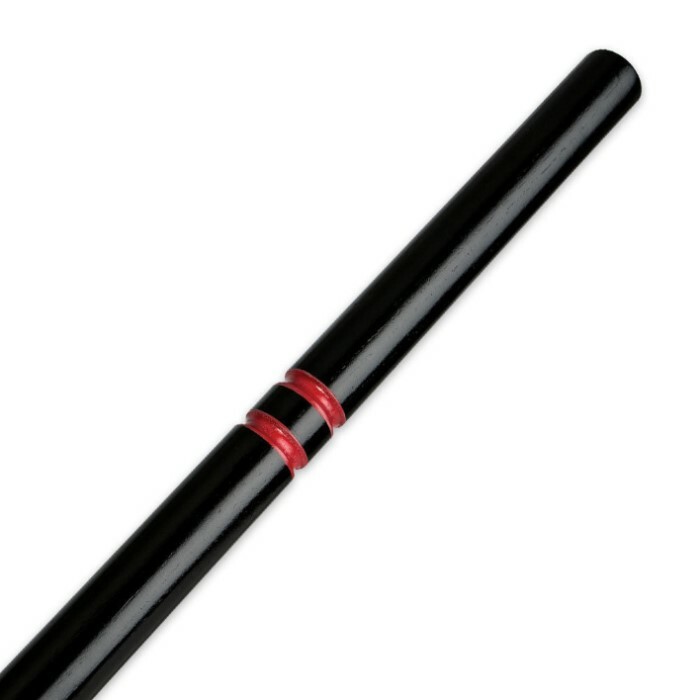 The Black Escrima Stick is definitely what you’re looking for. It is 26” of hardwood painted a sleek black with red grooves to highlight and assist your grip. This is a well-balanced escrima stick. These have a good weight and thickness. No problems at all with chipping or soft paint. I bought these sticks at different times, but they still look identical. 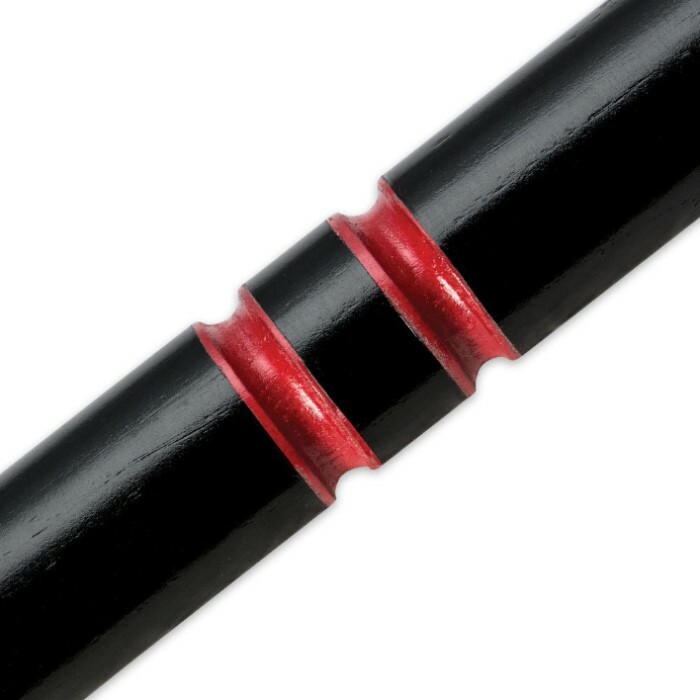 BudK also sells black wooden nunchucks and a black 6' bo staff, that all match each other with this double red-ring design. Makes a nice set. I purchased two of them and I got to say they are pretty cool. They both looked vary evenly shaped compared to each other and were sturdy looking. I dropped them a couple times and nothing scraped or chipped. The paint seems to come off a little but not too much. The only thing I have to gripe about is their shipping policies, I think that they should go off of the weight of the product not on the price of the products, but that's just me. I am very pleased with this product and will have a lot of fun with it. I bought this so I have something substantial in terms of self-defense in my college apartment. I love the feel and weight of it, there is only one issue, though. I'm not sure if it is suppose to be perfectly straight, but mine has a subtle but noticeable cure. It is an issue but not a problem, considering it curve like a katana pretty much, so it does now have more force in a downward stroke. So love it, it is awesome, buy one. The eskrima sticks are fun to have and good for practice, but get them in a pair. Otherwise they might send another that wont feel like quite like the first one. Weight was off on the second one i purchased at a different time. good weight and hardness but the red detail is just a red rubber band in the divot so that was disappointing. Bought these for my friend and he loves it. They look great, especially with the red accented lines. I can't believe that these were only $7! I was expecting something lightweight and cheap but these are strong, heavy and durable. Plus they look cool! These are the best for practiceing Arnis. i bought two as a cheaper alternative to bokken, but now i realize they are a completely different training style by being 14 inches shorter. it should be fun to match them against other practice items.